A literary treasure, The Pirate Hunter is a masterpiece of historical detective work, and a rare, authentic pirate story for grown-ups. Captain Kidd has gone down in history as America's most ruthless buccaneer, fabulously rich, burying dozens of treasure chests up and down the eastern seaboard. But it turns out that most everyone, even many respected scholars, have the story all wrong. Captain William Kidd was no career cut-throat; he was a tough, successful New York sea captain who was hired to chase pirates. His three-year odyssey aboard the aptly named Adventure galley pitted him against arrogant Royal Navy commanders, jealous East India Company captains, storms, starvation, angry natives, and, above all, flesh-and-blood pirates. 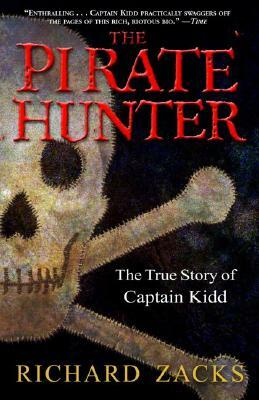 Superbly written and impeccably researched, The Pirate Hunter is one ripping good yarn. Richard Zacks is a graduate of the Columbia Journalism School, a former syndicated columnist for the New York Daily News, and a freelance journalist for Atlantic Monthly, Time, the Village Voice, London Times, Life, and other publications.